At the end of each year, I love looking back and deciding which were the best outfits for the past 12 months. This year we have see lots of amazing pieces, and it was extremely hard to decide which ones are my top favorite! 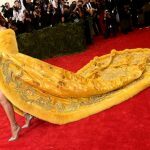 Rihanna showed up and stole the show with an insane creation in yellow. 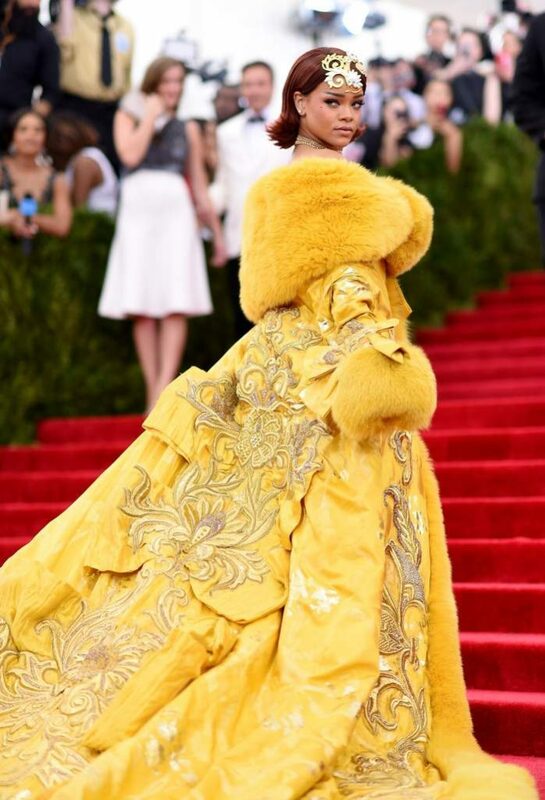 She wore an imperial yellow, fur-trimmed cape that was embroidered with floral scrolls, plus a headdress. 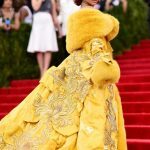 The dress was ”handmade by one Chinese woman and it took her two years to make” says Rihanna in an interview for Vanity Fair. Looked like the crop dresses were very popular at the ‘Vanity Fair’ Oscar After Party, as few celebrities were spotted wearing similar ‘nearly naked’ outfits. Gigi Hadid, however was my favorite look of the night! She wore a black AtelierVersace dress with cutout details from the Spring 2015 collection. Taking it all the way back to the 1920s, Kylie has shown us how amazing you can look in a dress featuring that decade. The Brazilian model wore a stunning dress dress by Zuhair Murad and she certainly left us speechless. The stylish singer showcased her fierce physique in a strategically embellished dress by Reem Acra, plus black Stuart Weitzman sandals. The Top Chef star had on a very tight, classic satin dress at the Emmy Awards. She showed off all her curves in the Romona Keveza dress. Do you have a favourite look for 2015? Previous Post 3 Outfit Suggestions for the Festive Season!